Land Rover today revealed the bespoke Defender that will transport the Webb Ellis Cup on a 100-day tour around the UK and Ireland in the build-up to Rugby World Cup 2015. In true Land Rover style the Rugby World Cup 2015 Defender emerged from a giant rugby ball, which had floated up the Thames from Tilbury Docks to the world famous Tower Bridge. 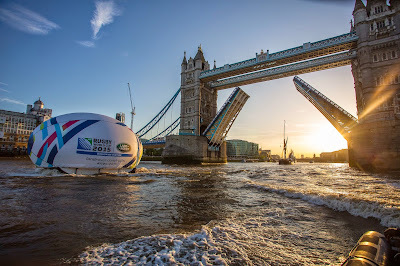 Constructed at a secret location the 8.2 metre high ball travelled 25 miles upriver on Thursday afternoon, passing London’s iconic landmarks; the Thames Barrier, North Greenwich Arena, Canary Wharf and finally passing through Tower Bridge before being moored at Butler’s Wharf. At dawn, the ball opened to reveal the Land Rover Rugby World Cup 2015 Defender, with Land Rover Ambassador and Rugby World Cup 2003 winner Lewis Moody behind the wheel. After driving the vehicle out of the giant ball, Moody was met by his Rugby World Cup 2003 captain and fellow Land Rover Ambassador Martin Johnson. Johnson was on hand with the Webb Ellis Cup to place the prestigious Trophy in the vehicle’s bespoke display cabinet. Adapted from a Defender 110, the vehicle was built at Jaguar Land Rover’s state-of-the-art Special Vehicle Operations HQ in Oxford Road, Coventry, and features a specialised integrated cabinet for displaying the Webb Ellis Cup whilst driving. Constructed according to the Trophy’s specific measurements for the purpose of transporting the coveted prize in the build up to and during Rugby World Cup 2015, the cabinet features innovative design technologies such as remote locking, lighting and temperature control via an App operated by the driver. The 100-day Rugby World Cup Trophy Tour, delivered by England Rugby 2015, begins on 10 June and the Defender will play a key role, transporting the Webb Ellis Cup around the UK and Ireland before delivering the Trophy to Twickenham Stadium for the Opening Ceremony on 18 September. The Trophy will also visit all Rugby World Cup 2015 Venues and Official Fanzones during the Tournament. The special design of the vehicle will enhance the viewing experience of the Trophy for all those across the country expected to be part of the Rugby World Cup Trophy Tour as excitement builds ahead of the Tournament. Land Rover recently launched its Rugby World Cup 2015 campaign, ‘We Deal In Real’, by asking some of its most high-profile Rugby ambassadors to lend a hand at a grassroots match in Hampshire, England. A Worldwide Partner of Rugby World Cup 2015, Land Rover rewarded amateur side Racal Decca RFC, recognised as the 'Smallest Rugby Club in the World', for its commitment to Rugby, by providing a host of the game’s biggest names to assist in the routine match day preparations. International stars such as Jonny Wilkinson, Sir Clive Woodward, Bryan Habana, Brad Thorn, Matt Giteau and Felipe Contepomi were present to fulfill all the match day roles from putting out the flags to leading the warm-ups and giving the pre-match team talks. Land Rover’s ‘We Deal In Real’ campaign will champion the people that are at the heart and soul of the game by putting grassroots clubs like Racal Decca on the global stage at Rugby World Cup 2015. 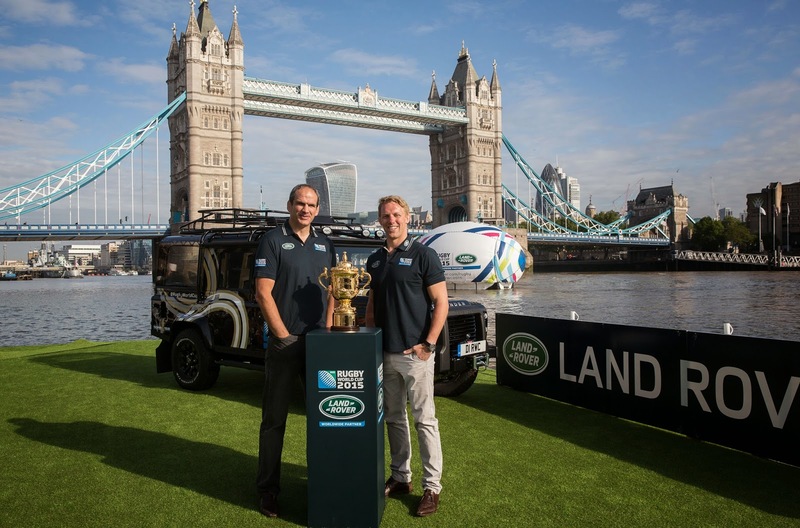 In addition to providing the Rugby World Cup 2015 Defender, Land Rover has been a Presenting Partner of the International Rugby World Cup Trophy Tour, which culminated in France earlier this month and saw the Trophy visit 15 countries around the world. Throughout the Tour, Land Rover committed to take the Webb Ellis Cup to places it has never been through its Least Driven Path activity, giving those around the world who would never otherwise see the Trophy the chance to do so, and helping England Rugby 2015 build excitement for the sport’s global showpiece.